"No sooner had it appeared than it vanished, leaving her wondering if her eyes had been playing tricks on her." This week I'm excited to host a book giveaway for a copy of Leigh Russell's new suspense novel and first installment in her new mystery series titled Journey to Death (published February 9th by Thomas & Mercer). Russell is an international, bestselling author with over half a million copies sold. Booklist writes of the new series "Russell evokes the exotic locale beautifully, but readers will be in the grip of the suspenseful story, too, even as they feel the island heat and smell the flowers." This giveaway is restricted to U.S. participants only (sorry!) and runs from 3/21 - 3/23. Below are five different ways to enter to increase your chance of winning. Good luck! Journey to Death is the first installment in a new crime series starring a reluctant young detective tested to the very limits of her endurance. 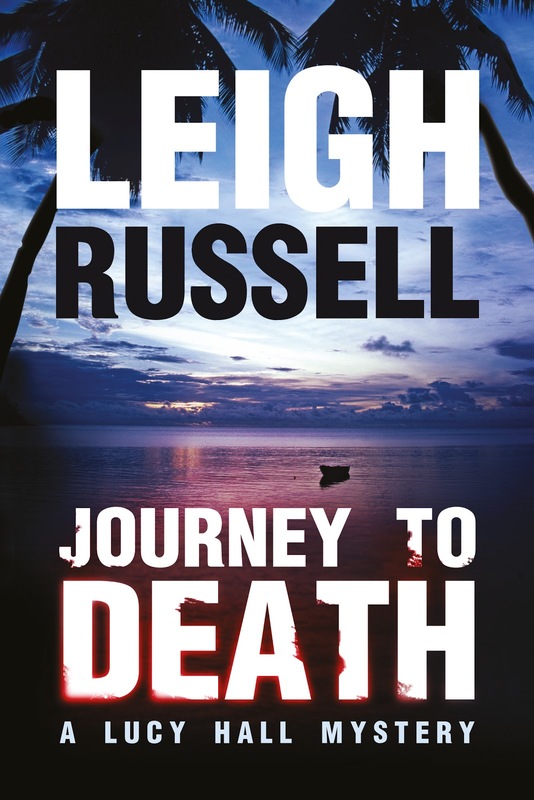 In Journey to Death, Russell takes the reader on an exhilarating adventure from the idyllic tropical beaches of Mahé into the island's Dark Cloud Forest. Lucy Hall arrives in the Seychelles determined to leave her worries behind, and her cheating ex, behind. Newly single and tagging along with her parents on their romantic break, Lucy promises herself the holiday of a lifetime in sun-soaked Mahé. Her father, having lived and worked on the island in the seventies, is keen to show her the paradise he once called home. But appearances can be deceiving and, as Lucy soon discovers, the island is hiding dark secrets that threaten to turn their dream holiday into a nightmare. As the number of strange and violent incidents rises, it becomes clear to Lucy that someone on the island is out to get them. Could her father's past hold the key that might save all of their lives? And will Lucy discover the truth before it's too late? Taking out her phone Lucy took a series of pictures, although no photograph could reproduce the feel of the sea breeze on her face, the colours of the palm trees and the glorious flowering bushes, or the sound of waves on the sand. Her pictures would serve as souvenirs, something to cling to when her recollection faded. Over the past few weeks, so many people had assured her that the memory of her pain would fade in time. It was true. Here on this beautiful morning she had barely given Darren a thought. Frothy white water raced up the beach. As each wave drew back, the sand appeared to dry instantaneously. She was not sure if that was due to the heat drying out the sand, or if the water seeped down rapidly to leave the surface dry. She could have stayed there all day, lazing in the shade, watching the ocean, but she had told her parents she would be back for lunch and she knew her mother would fret if she was late. Reluctantly she gathered up her belongings and started on her slow trek back to the hotel. It was too hot to hurry. Instead of walking along the edge of the sea where she would be exposed to the sun, she kept to the dappled shade of ancient trees that formed a backdrop to the beach. Reaching the stretch of massive grey boulders she picked her way between the smaller ones, again avoiding looking at the dead fish. She lost her footing on the smooth surface of a boulder and nearly slipped over. Her heart thumped as she regained her balance. Placing her feet with care and advancing laboriously, she stepped out from the rocky terrain onto soft sand. This was too beautiful a setting to abandon to memory completely. As she rummaged inside her bag for her phone, the rhythmic crashing of waves breaking against the rocks was disturbed by a loud thud. Spinning around she saw a large boulder lying on the sand only a couple of inches away from her. It had not been lying in her path a few seconds earlier. If she had not stopped to find her phone, her blood would now be seeping into the yellow sand, her bones crushed by the large lump of granite. Her phone slipped from her hand. She took a step back on trembling legs, as though the inert rock was threatening her. Shading her eyes with one hand she stared up at the huge wall of rock, but could see no signs of disturbance. It must have been a random boulder that had fallen in her path. She wondered if the vibrations from her footsteps could have dislodged it from some precarious perch high above her. It was hard to believe the rock had fallen by coincidence, exactly in the spot where she was walking. Dazzled by the light and dazed with shock, she thought she saw the silhouette of a person outlined against the sky. In the time it took her to blink, the outline had disappeared. A few seconds later she spotted a figure loping away towards the road. No sooner had it appeared than it vanished, leaving her wondering if her eyes had been playing tricks on her. Leigh Russell is the author of the internationally bestselling Geraldine Steel and Ian Peterson crime series. She studied at the University of Kent, gaining a master’s degree in English. She has a Diploma in Specific Learning Difficulties from the British Dyslexia Association, and a Certificate in Teaching English as a Foreign Language. For many years she taught English at secondary school, specializing in supporting pupils with specific learning difficulties. She is married, has two daughters, and lives in north-west London. In addition to writing, she guest-lectures for the Society of Authors, universities and colleges, and runs regular creative writing courses for the prestigious Writers Lab in the UK and Greece. She also runs the manuscript assessment service for the CWA.